La conspiracy d'explained tres simple! La Lettre fait par un Hostie Canadian lupo! Parlez avec la Nigerian Scammer mon d'argent! 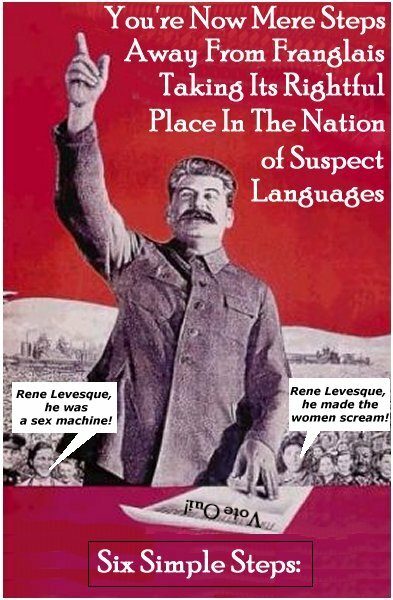 "Hey, finally a second language I can speak but, like, so few actually speak it … willingly. 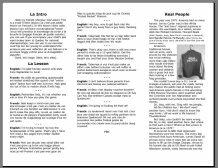 What can I do to increase Franglais' public exposure, drive traffic to Karl Mamer's wonderful web sites, and abuse my work's laser printer/photocopy machine?" I'm so glad you asked! 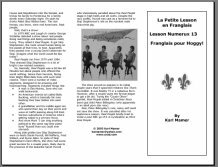 I've created several PDFs of select Franglais lessons. They're in a "z-fold" brochure format. 2. Print the first page. 4. You're ready for the complicated Z-fold now that it's all printed out and stuff. (It's preferable it's on some eye catching color paper but I mean white is fine. It's your call. Don't let me micromanage. But I do prefer color. I'll just say that.) Make the Z-fold as pictured below. 5. After you've folded it, distribute it in a fashion you're most comfortable with. Give a copy to a friend. Leave a copy in a Starbucks. Slip them into copies of that snooty Petite Larousse at the bookstore. Leave copies in record stores. 6. When you notice my name in the paper, email me and tell me I'd be nothing without your evangelizing efforts and demand I repay you by coming to stay at your apartment for a few days.